A couple of days ago, I briefly covered the mythical specification “non-accumulative tolerance” (or “non-cumulative”) as it is often applied to direct dimensions on feature patterns. See the example in Figure 1 where the dimensional callout attempts to simply dimension a pattern without considering tolerance stack-up. However, this attempt fails since any two non-adjecent holes cannot avoid accumulation of tolerance due to the dimensioning scheme. The problem gets worse if three or more positions within the patten are compared to each other. ASME Y14.5-2009 actually provides a linear method to detail feature patterns, called repetitive features and dimensions. See Figure 2. Unfortunately, the standard does not provide any tolerance rules for its prescribed scheme. Presumably, this leads us to interpret a repetitive feature dimension as though it is shorthand for chain dimensioning. Chain dimensioning accumulates tolerance as the pattern departs from the dimensioned start position. Sometimes this is OK, but often this is unacceptable since the accumulation of tolerance can quickly lead to features that do not align to mating features on other components. Another dimensioning scheme that I’ve seen involves a complete disregard for the fact that a pattern exists. See Figure 3. Directly dimensioning each of the positions within the pattern to each other may be acceptable in some scenarios, but likely isn’t a very clear choice for larger feature patterns. The problem with this scheme is that it can be very difficult to determine the true accumulation of the tolerance stack-up. It may also be difficult to determine design intent. To avoid the issues associated with other direct dimensioning schemes, one may choose to use baseline dimensioning, which may also be called rectangular coordinate dimensioning in some scenarios. The advantage of a baseline dimension scheme is that it limits the accumulation of tolerances to the stake-up from just two dimensions. This is because the total stack-up between any two positions within the feature pattern are related through a common baseline. 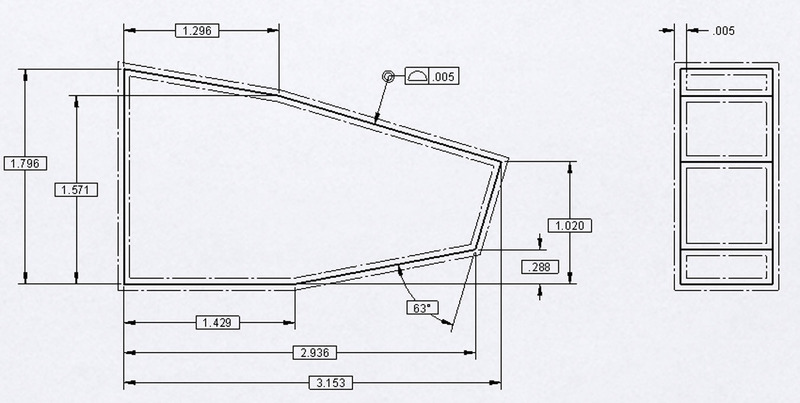 The problem with baseline dimensioning is obvious in Figure 4; its take up a lot of space on the drawing. A common alternative to baseline dimensioning is ordinate dimensioning, also known as rectangular coordinate dimensioning without dimension lines. This scheme also relies on a baseline, referred to as zero (0), from which all of the features are dimensioned. 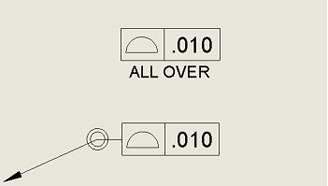 The advantage of ordinate dimensioning is that it takes up far less space on a drawing, as shown in Figure 5. Tolerance stack-up is limited to just two dimensions between any two positions within the pattern. The best way to avoid accumulation of tolerances is to use a methodology that does not rely on any form of direct dimensions. ASME Y14.5-2009 actually suggests that GD&T should be used instead of direct dimensions to locate features. I have discovered the hard way that many individuals in the engineering field have an irrational fear of GD&T. Even still, GD&T provides a far superior method for the location of positions within a feature pattern. The example in Figure 6 shows a less cluttered drawing. With the addition of MMC to the feature control frame, this method could provide even better results since it would make use of bonus tolerance. The position of each feature within the pattern has an optimal tolerance zone that more closely matches design intent. One more added benefit is that all features controlled by a signal feature control frame are automatically considered as a pattern. 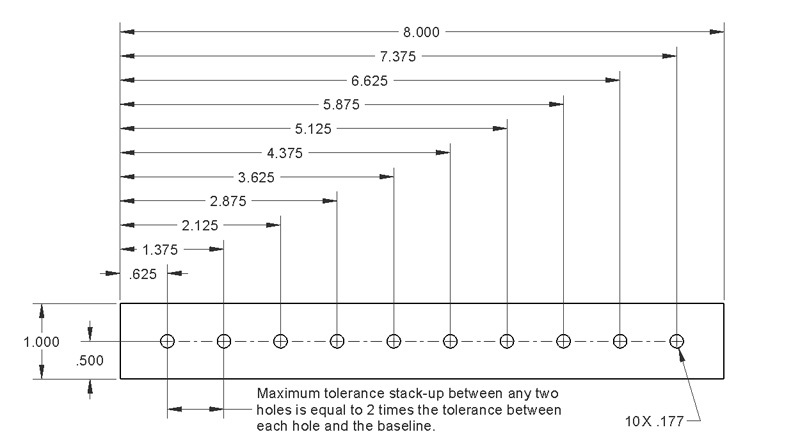 Since the tolerance zone is optimized, using GD&T may help reduce costs by allowing the manufacturing process to vary in a way that is more in line with design intent. In turn, this can reduce the number of unnecessary part rejections. When detailing feature patterns, one may wish to avoid the use of direct dimensioning methods or shortcuts like the mythical “non-accumulative tolerance”. The best choice to detail a feature pattern is GD&T. However, if GD&T is not desired, the next best method is prolly an ordinate dimension scheme. It should be noted that for each of the dimensioning and tolerancing schemes shown within this article, there are a variety of ways to implement them. This article is meant to present general examples. Actual tolerancing requirements are guided by design intent and other considerations per individual cases. ASME Y14.5M-2009 has been out for a little while now (after almost a year’s delay). There are significant improvements and clarifications. One addition in particular caught my attention, the ALL OVER symbol. When applied to a Profile of a Surface, it pretty much defines the entire shape of a part in every direction (not just ALL AROUND which applies to the profile of a surface along a particular plane). The symbol is either a double circle at the vertex of the associated bent leader, or the words ALL OVER placed immediately below the feature control frame. The symbol indicates that a profile tolerance or other specification shall apply all over the three-dimensional profile of a part. It is applied as “unless otherwise specified” to allow for other existing dimensions and tolerances to take precedence. The advantage of using this symbol is that it provides control of surfaces over an entire part without regard to part orientation, thus allowing us to directly reference the CAD model as basic and fully controlled, while still detailing critical dimensions and tolerances. This may help companies better parts where they rely on the CAD model to provide complete specification. In fact, where a CAD model is declared basic, companies may be able to effectively place the Profile of a Surface FCF with the ALL OVER symbol right into their drawing title blocks along side other tolerancing information. Author fcsuperPosted on July 24, 2009 February 20, 2010 Categories ASME Standards, Drawing, PartTags all around, all over, FCF, GD&T, profile, profile of a surface, tolerance, tolerancing2 Comments on It’s All Over!